My regular readers have certainly noticed that I like to use command line tools even when using a system with X Windows installed. In an earlier post, I have already mentioned mp3blaster, my favourite music player. Now I have learned about many more command line audio tools. 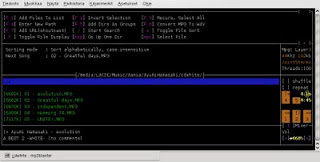 18 CLI Audio Tools for Linux presents a nice collection of command line audio tools for Linux. I have used some of them and I will certainly use a few more of them in the future. I'm sure you will find something new there, too. Who needs Amarok or Rhytmbox for playing mp3 or ogg vorbis files? I dont.